One of the things many people forget to consider when searching for a new garden table is maintenance. Wood and cast iron are popular choices of material for garden furniture, but they are high maintenance. Maintenance comes with additional costs. Furniture covers, sandpaper and weatherproof paint all add to the cost of iron and wooden furniture. 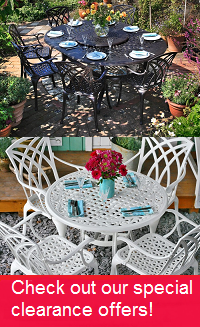 Our round garden tables are made of cast aluminium. This makes them weather resistant and virtually maintenance free. There's no need to spend time and money sanding, painting, covering or hauling our garden furniture to shelter. Leave it outside all year round and it will survive the colder seasons with ease. No rot, no rust. When the Sun comes out again, spend more time enjoying your garden and less time worrying about your outdoor furniture deteriorating. Our round aluminium garden tables come in many different sizes, designs and colours. So whatever you need for your garden, you'll find it in our range. The Alice table is one of our most popular 4 seater round garden furniture pieces, with lattice and Celtic knot designs on its table top. It measures 120cm across and is available in Antique Bronze, white, and Slate Grey. If a 2 seater garden table set is what you're looking for, take a look at the Ivy table set. This 2 seater bistro table and chairs features a fabulous ivy chain border design on its 63cm table top. It's perfect for intimate dinners and drinks in smaller gardens or patios. The Ella table is another lovely 2 seater patio set which has proven popular with our customers. We've had over 60 positive reviews for this marvellous cast aluminium round table. It weighs just 6.5kg, so you can try out different spots in the garden with ease. If you like the look of our Antique Bronze metal garden furniture, this table is available in this colour, as well as white and Slate Grey. If you need a little more capacity, try the Olivia table. This is one of our round 8 seater tables measuring 180cm across. It's both beautiful and functional, with some of its functionality owed to the Lazy Susan turntable that comes with it. Many of our large round tables come with a Lazy Susan. These practical turntables are a great addition to patio tables at mealtimes, allowing your guests to pass around sauces, salads etc. without reaching over one another. The Frances table for 6 people also comes with a Lazy Susan included. You can purchase it in Slate Grey, Antique Bronze, or white. A few of our round garden tables in this category are tables only, but many are metal patio sets consisting of a table and chairs. You will find that these outdoor furniture sets come with a choice of garden chairs. A default chair will always be available at no extra cost, but we offer some other chairs with different designs. If you prefer another chair, such as the Emma or Kate chair, you can pair it with your table for between £5 and £20 per chair. If you're purchasing a table and chairs set, you'll have some fantastic offers available to you. Many of our customers accessorise their round garden furniture set with useful accessories such as a parasol and seat cushions. Underneath the section where you choose your chairs, you’ll find offers for seat cushions and parasols in various colours. Purchasing these accessories alongside your round cast aluminium garden table means you save 70% on them, compared to buying them separately, so don’t miss out! The friendly Lazy Susan team is available to take your calls or answer your emails from 08:00 to 18:00 daily. They can provide more information about our cast aluminium garden furniture and respond to any other questions you have. They can also send you fabric and metal samples. These give you an idea of our materials and help you select the colour which best suits your garden. Call us on 01243 717197 or email us at sales[email protected]. We try to answer emails within 2 hours during office hours. Please take a moment to photograph your new patio furniture to help us raise money for our Do Some Good charity campaign. Just take a few pictures and share them on Facebook or Instagram with the tag @LazySusanFurniture or email them to us. We then donate £10 for any set of photos of Lazy Susan furniture in your garden. We’ll donate £20 for photos including friends and family during a family lunch or BBQ. Your help goes a long way.